The Revenge of the Forgotten? First, the new normal of a dead heat between the Conservatives and the Liberals is almost exclusively a product of the terror and security file. The more daunting issues of a stagnant economy, arrested progress, and regime fatigue are lurking in temporary abeyance. Second, the profoundly different landscape from what we saw in late summer owes its new quality largely to one major shift in the demographic constituency for the Conservatives, linked to above. Hint: if you are older and poorly educated, you are really concerned with the messages on terror and security emanating from Prime Minister’s Office. Third, the supposed public consensus around Bill C-51 is illusory. On the more accessible question of whether police and security should have more powers, our tracking shows a dead split. This is definitely up as a consequence of recent events but the rise is almost exclusively in the groups noted above and Conservative supporters. No one else is much onside and there are serious questions about the shelf life of this support. 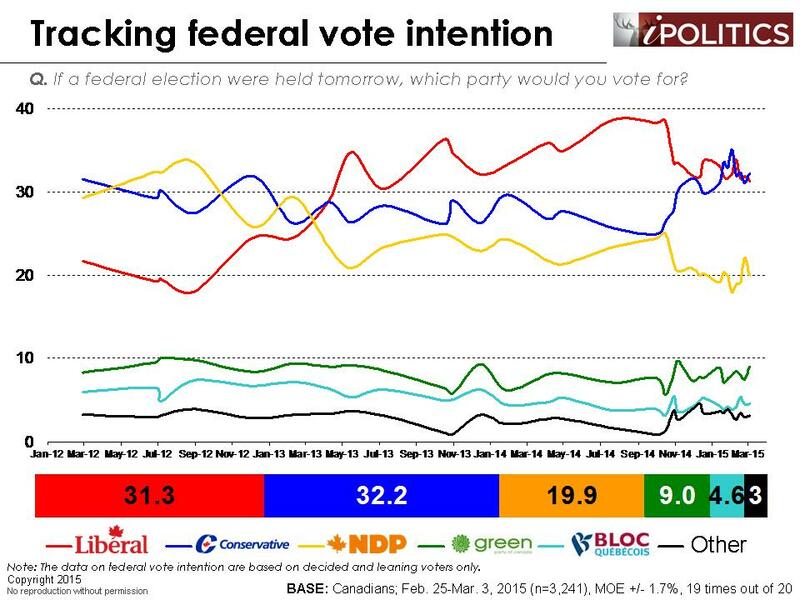 Fourth, the Green Party is sticking around and showing real and unexpected strength compared to the last election. They could become a real force if the current deadlock continues and they manage to up their game just slightly. A major brake on their prospects has been tepid turnout due to a sense that it is largely a symbolic vote with little chance of an MP in the offing. As their supporters’ vote intentions firm, however, their prospects rise. 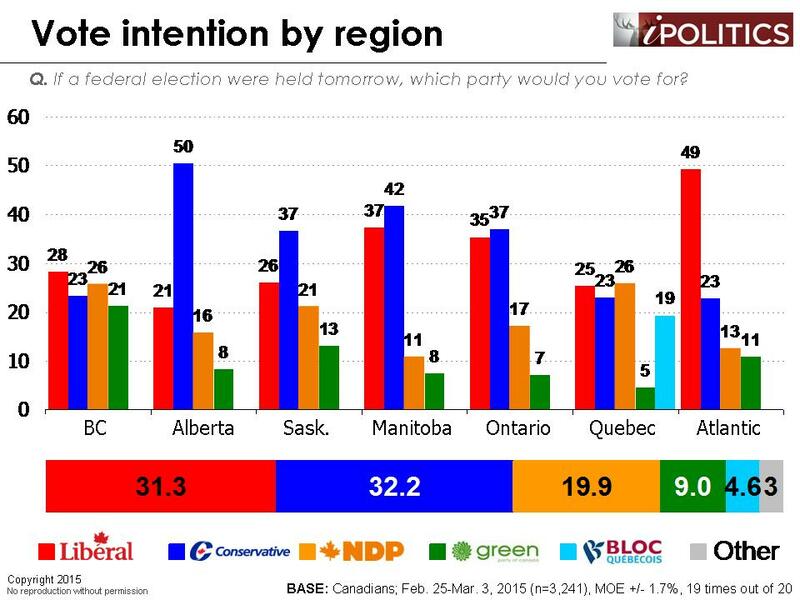 Indeed, if the race continues to narrow, this election could be very different for the Green Party. The demographics show the now familiar reassembly of the Conservative base of older, less educated, and male voters that was their key to success in 2011. Given the strength and recency of the move of the elderly and less educated move to the Conservatives, and the current context of security and fear, these groups bear closer examination. In most parts of our society and economy, the values and preferences of the old and poorly educated aren’t in much demand. We rarely see them in advertisements or at gala openings and they are not trending in social media and they are generally largely forgotten. Whatever insignificance e they may feel in all of these other mainstream parts of our society; they are certainly having a profound impact on our democracy and national direction. Consider it arguably the revenge of the neglected. The term revenge of (famously applied decades ago to nerds) isn’t a conscious act of self-awareness; rather a situation where their very different values and beliefs are actually driving the agenda. The more cynical view is that some of the frailties in their reasoning and deliberation powers are being exploited for political gain. Consider the following chart which compares the current voting landscape as it would look with them included , excluded and on their own. It helps explain a lot of the very different voter landscape which has emerged over the pasts several months. Without question, security and terror have been the sorting mechanism and animators of the new normal seen today. And there is a reason that the Conservatives have been unremittingly hammering at the tough on terror and security themes. It has brought clear returns, particularly with the older and less educated voters who have moved en masse to their camp. The Quebec move to the Conservatives has been driven by not so much security as the fact that this security focus is on Jihadists and it links to secularism and xenophobia. Let’s have a deeper look at how this evolved with a view to understanding where it may go. What this tracking suggests is that security concerns are definitely inflated, but they are not inflated to anywhere near the levels they were following the September 11th attacks. In fact, even with this (likely artificial and temporary) jolt to security, the overall lean on security versus civil liberties still clearly favours civil liberties. 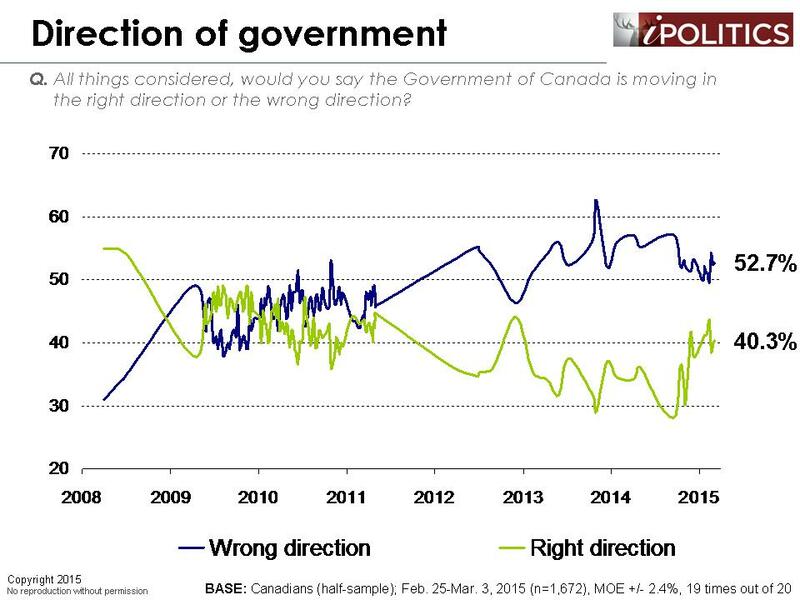 Furthermore, all of the previous patterns show that any disruptions in response to a security incident (in this case, the Parliament Hill shooting and the Paris attacks) are always followed by a diminution of support for security over civil liberties as time goes on. We expect that this time will be no different and, while its’ not significant, we have already seen a modest swing back to the civil liberties side. Finally, it is worth noting that this issue is extremely divided along partisan lines. 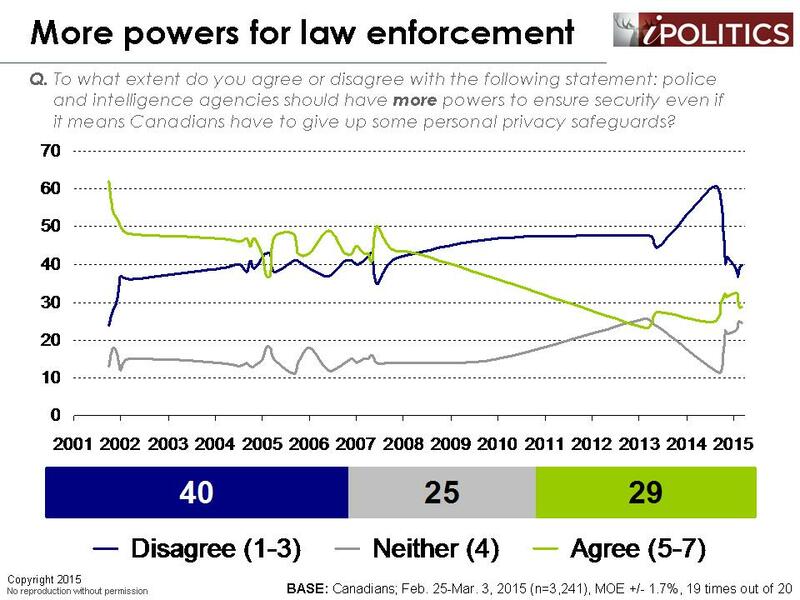 While we did not ask specifically about Bill C-51, the question on the trade-off of additional powers for police and intelligence agencies serves as a useful proxy. Support is strongly focused in some very specific segments (e.g., older and less educated Canada) and we can find no evidence to support the idea that there is some massive wave of public support for such a bill. In fact, outside of the Conservative base, clear majorities oppose new police powers. We have a direct test of support for Bill C-51 in field right now, and the preliminary results suggest a far more divided public than for some of the earlier polling on this bill. 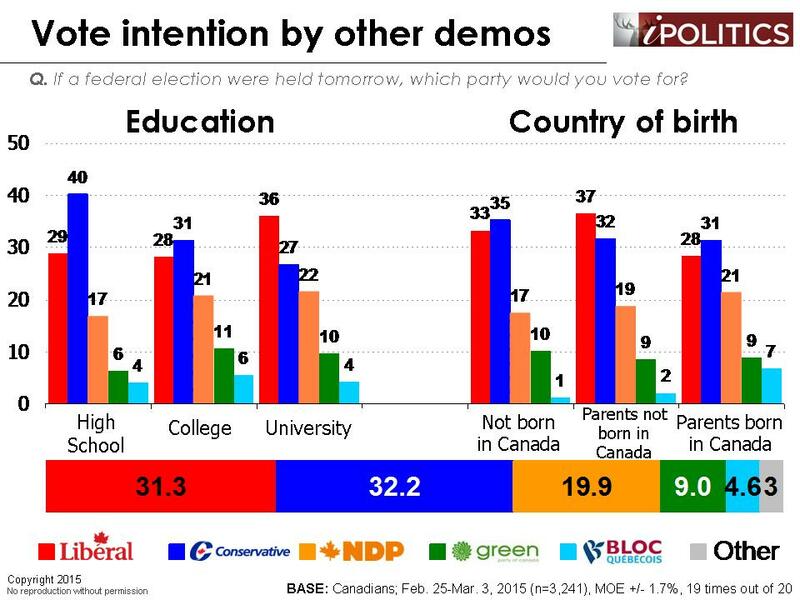 Overall, we do not believe Liberals and NDP supporters should be particularly concerned with the recent rise in Conservative fortunes among the less well-educated. It is not entirely clear that high school educated voters vote strongly, nor that they will remain in these positions. 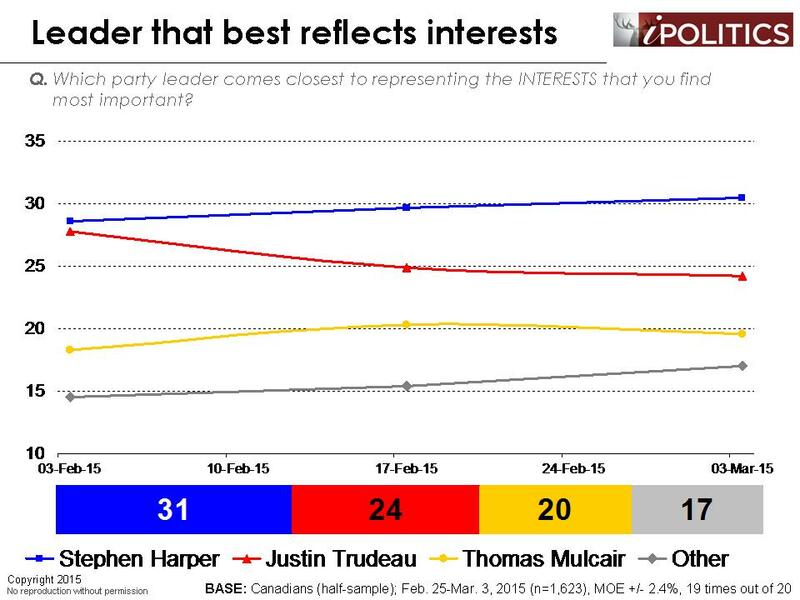 Seniors, on the other hand, are an important segment that progressive parties can ill afford to lose. This segment is a larger portion of the electorate and tends vote in large numbers and there has been an enormous swing to the Conservative (from a 10-point Liberal lead to a 13-point Conservative advantage). 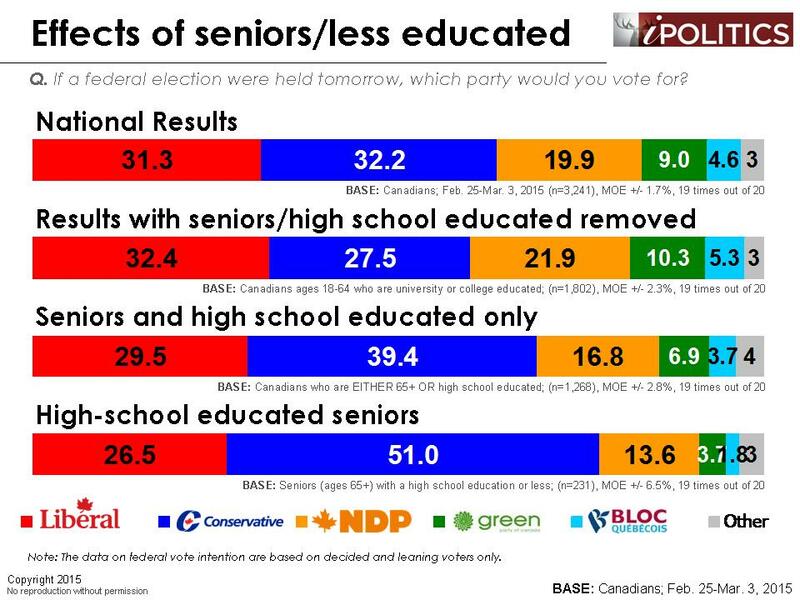 Nevertheless, seniors are an important and accessible vote to the progressive parties – particularly the Liberals – than the less educated vote. 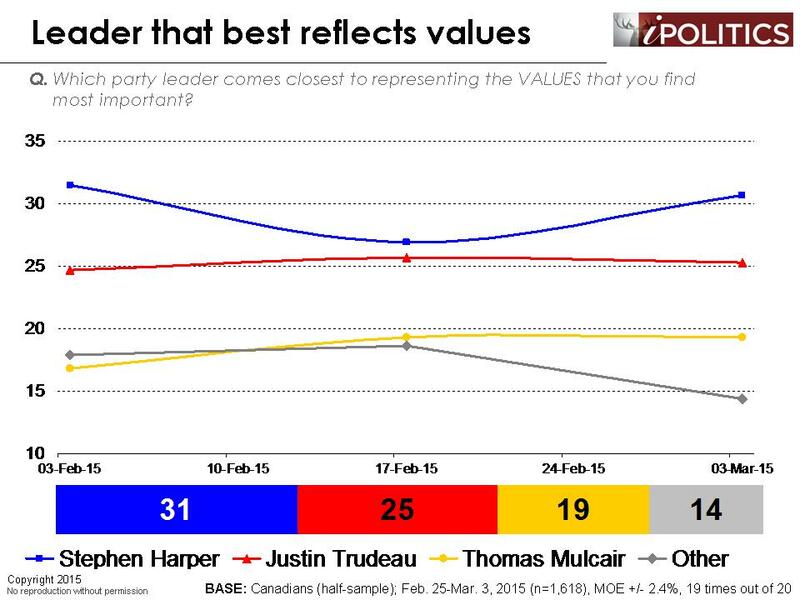 Seniors in Canada today are better educated and more progressive in values than any other seniors cohort in history. 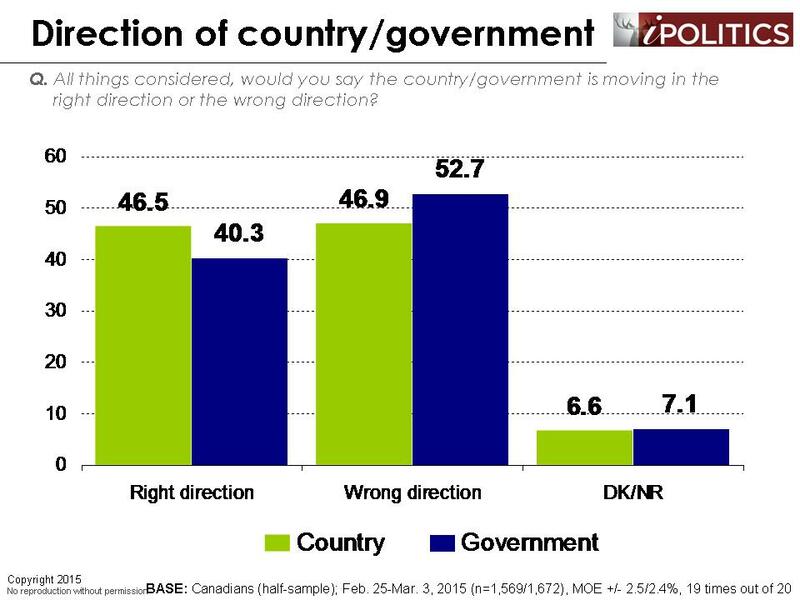 Indeed, they were leaning strongly towards the Liberals just a few short months ago. 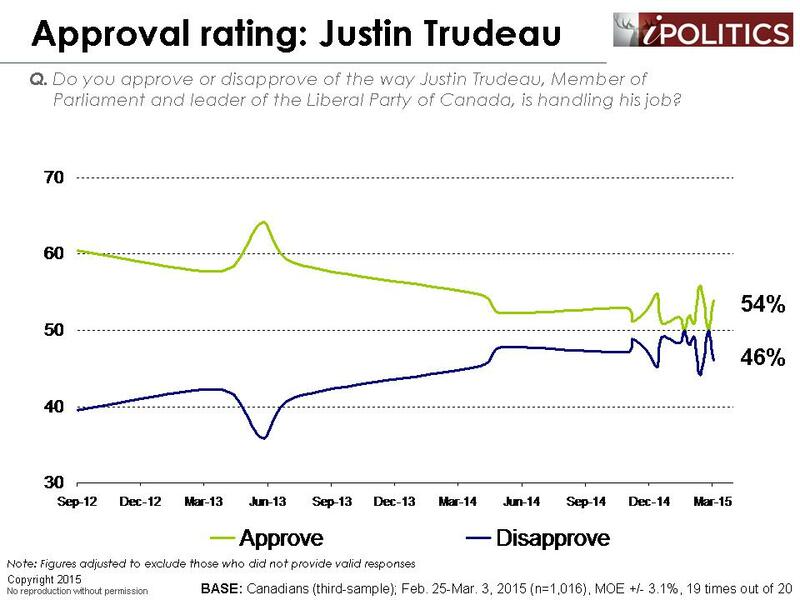 What should be concerning for the opposition, however, is the stable – and possibly growing – advantage that Mr. Harper enjoys on the values front. While it is probable that this advantage is being driven by temporary concerns over security and will likely erode as economic and social concerns begin to displace this effect, it is values that drive emotions, and as we all know, emotions win elections. It will be interesting to see in the coming months whether the progressive parties will make headway on values, which will be critical to the outcome of the next election. The field dates for this survey are February 25 – March 3, 2015. In total, a random sample of 3,241 Canadian adults aged 18 and over responded to the survey. The margin of error associated with the total sample is +/-1.7 percentage points, 19 times out of 20. 5 comments to The Revenge of the Forgotten? Thanks for this analysis. I presently live on Coast Salish territory in Victoria BC, where the Green phenomenon is real. Elizabeth May who is in the riding next door is widely seen as having done a terrific job. She gets kudos for being first to call our attention to the dangers in C-51. Tracking what happens to the Greens will be very interesting. The ingredients are there for the Greens to make significant breakthroughs. They have the NDP running scared in south Vancouver Island and have nominated some terrific candidates. It would be worthwhile to have income classification with voter intention. The NDP used to be committed to the abolition of poverty, a policy so central it was the sole domestic policy listed in the preamble to the party constitution. 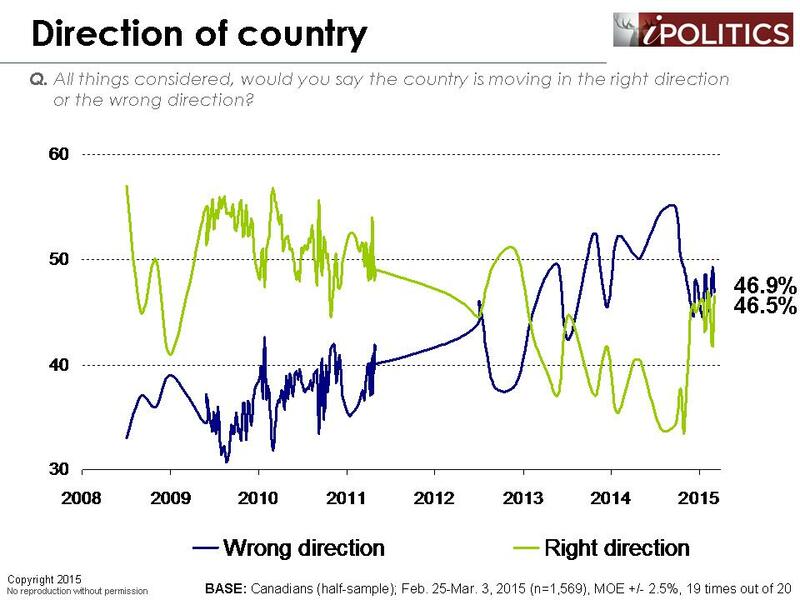 And the strongest correlate of NDP voting was the inverse correlation with income. 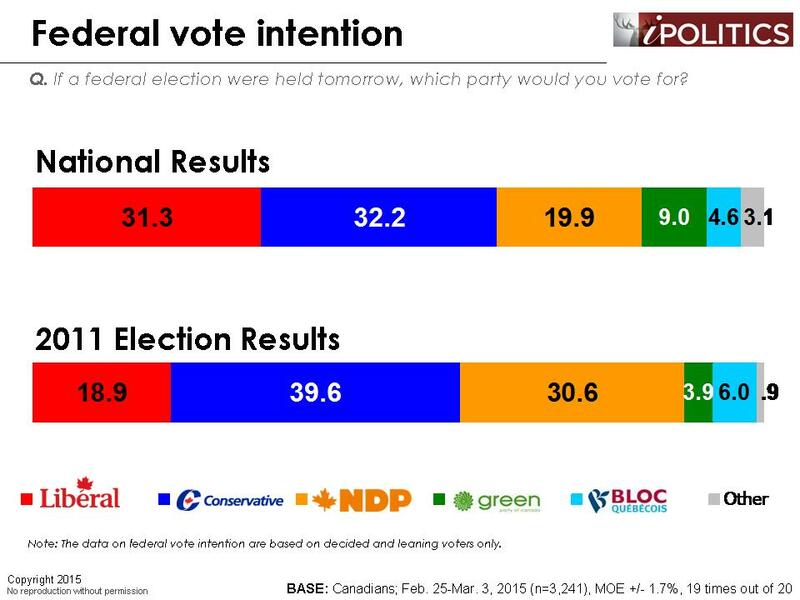 However the NDP has been afflicted with tax cut paralysis and the result has been the evisceration of anti-poverty policy, an area where the Greens now lead. In B.C., the last NDP government had lower welfare rates for singles than Mike Harris Ontario or Ralph Klein Alberta. In B.C. I believe the ascenion of the Greens has been their far clearer commitment to the alleviation of poverty, much stronger than the NDP. The Greens could be on the cusp of replacing the NDP as the party of social democracy, in B.C. first and then in Canada. So I would like to see a question on household incomes for poll respondents. Mr. Graves, The Ekos Rethinking Government attitudinal survey which found the values of elite Canadians to be almost the inverse of regular Canucks was one of the most profound explorations of Canadian values ever. And probably one of the most challenging since it involved interviews with the elites such as corporate executives and deputy ministers where respondents had to be chosen not randomly but selectively. I used the survey several times as an editorial writer with the Vancouver Sun even having a brief telephone interview with you once. I hope it can be updated. Wanted to second that analysis of leaders/parties should include Green Party information/questions, looks like they could be very interesting this election! I also agree with the other commenters here that The Green Party is a strong political force – especially in B.C. – and should not be left out of statistics. 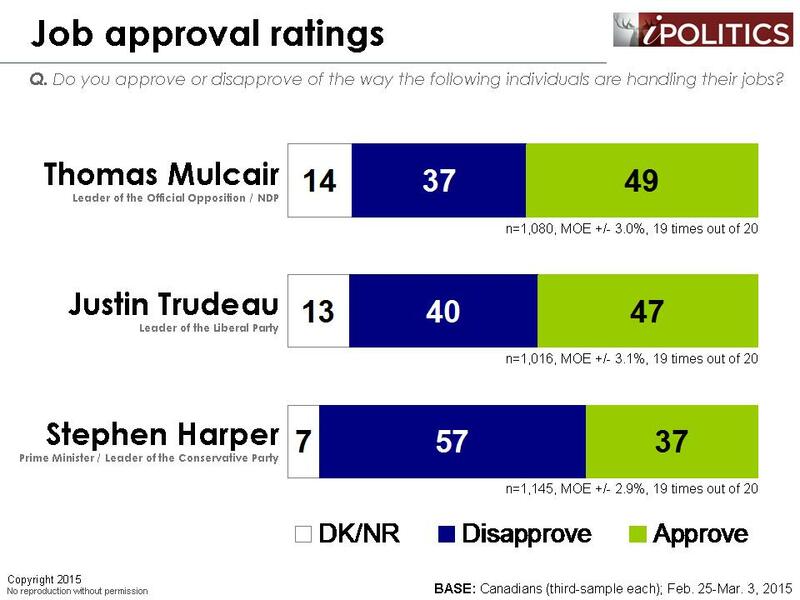 And in my own opinion neither should Elizabeth May be excluded from the leaders debate. I think she definitely deserves it!